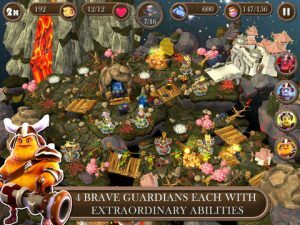 Brave Guardians HD is an iPad game developed byAshot Balasanyan / Chundos Studio. I have to admit, defense games are not generally my favorite types of games to play on mobile. That being said, I was immediately struck by the lush graphics of Brave Guardians HD. Both the character designs and level designs really pop, and I found myself immediately drawn in. There are 4 different worlds (Forest, Desert, Winter, Lava), each of which has its own unique charm. 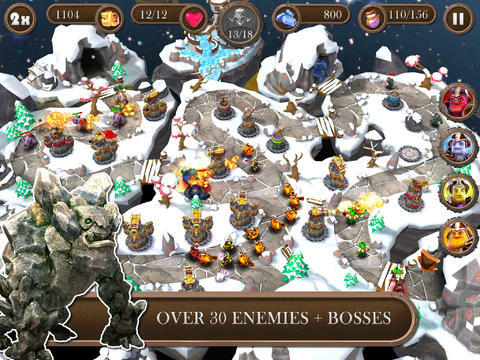 There are also 30 different types of enemies you will encounter. There are three levels of difficulty: Normal, Hard, and Insane. You can start the game in Campaign mode, but then unlock “Guardian” mode after you have beaten the stage with three stars. This gives the game pretty great replay value, especially for perfectionists. The earlier versions of this game had some issues. As of Version 1.0.3, the progress saving bug has been addressed. Some minor performance tweaks were also made. 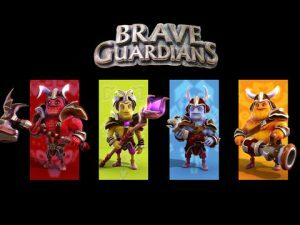 Developer Note: Brave Guardians is a graphically intensive 3D game, therefor we don’t recommend iPad 2 & iPad Mini devices, due to lack of memory you may face crashing issues. That being said, we tested this game on an iPad 2, and it worked great. The graphics were lush, and there were no lags, even on “insane” mode. 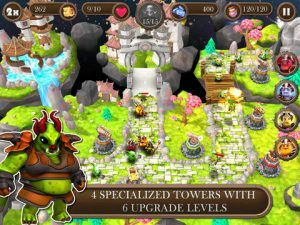 Even if you aren’t usually a fan of defense or strategy games, the fantasy world developed in Brave Guardians HD is pretty darn sweet. This game is free, so you really have no excuse not to give it a spin. This is, bar none, my favorite defense game on the iPad right now. Brave Guardians HDrequires iOS 6.0 or later. Compatible with iPad.